I am a student Fellow in the Kahn Institute of Liberal Arts yearlong project “The Power of Disappearance”. There are 15 faculty and 4 student Fellows in my group and we are all studying vastly different topics that revolve around the single word “disappearance”. My honeybee passion has been ongoing for a few years now, and for this Kahn project I decided to push my boundaries and study disappearances within native bee species. I went into the project knowing I wanted to make a film, because making a film is much more fun than writing a paper or creating a powerpoint, both for me and the viewer. Plus, I saw this as an issue that could inspire action, and films often have the power to do that. The film Queen of the Sun is what initially got me into studying bees, and I wanted to pay homage to that. Over Spring Break I traveled to Gainesville, Florida to interview researchers in the native bee biology lab at the University of Florida. I had never been to Florida! Cory Stanley-Stahr, a post-doc in the bee lab, is an incredibly kind and knowledgeable person and was the person who I organized the trip with. She picked me up from the airport and helped me set up interviews with people in the bee lab and community. I filmed Cory explaining what native bee hotels are, and how people can help native bee populations by building bee hotels and providing more nesting spaces for these bees. I also interviewed two of Cory’s lab technicians, including Mary, who dissected a frozen bumblebee hive to show me its components (have you ever seen the inside of a bumblebee nest?). My aim is to create a film that educates people about bees (other than honeybees), explains why native bees matter, and addresses simple ways people can help native bee populations. 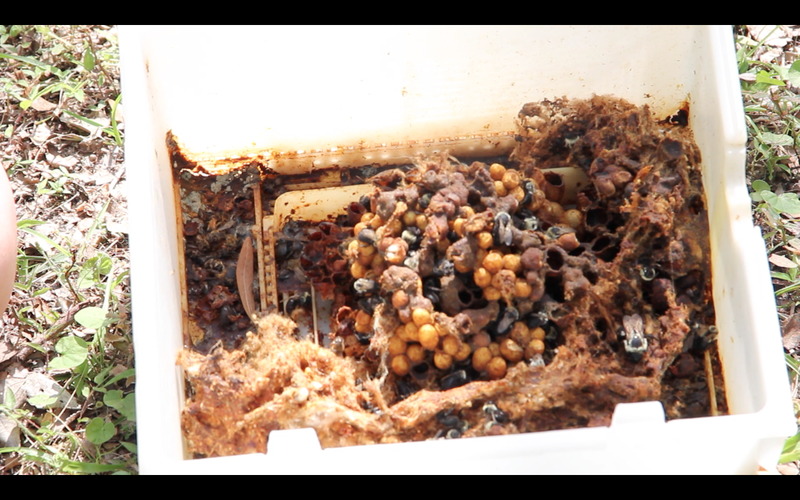 The inside of a bumblebee nest- a still shot from my film. You can read more stories and see pictures from my adventure at thesecret-lifeofbees.blogspot.com. Also please come to my Collaborations presentation where I will be debuting my film on campus: Saturday April 18th at 10:45am in Seelye 106. -Haley Crockett is graduating this May and is an American Studies major and proud Sustainable Food concentrator at Smith. For my second practical experience for the sustainable food concentration I decided to pursue an internship at a farm in rural Jamaica that does top-bar beekeeping. I am staying with Kwao and Agape Adams and their five sons, where I share a cabin with fellow intern, Kaat, right by the Caribbean Sea. Thus far, I have experienced building hives, inspecting and feeding bees, splitting colonies, transporting bees, preparing a new apiary, and traveling the island with beekeepers from the U.S. who train local beekeepers about top-bar techniques. Kaat and I holding comb while inspecting a hive. 1) It is a natural beekeeping internship. Finding an internship opportunity with bees is fairly difficult, and to work on a farm that uses no chemical pesticides and only natural techniques is rare and amazing. 2) You can apply to come to the farm on dates that work for you. Have plans for half the summer but want another learning experience for the other half? You can apply to come to Yerba Buena in a way that fits your schedule. Along that vein..
3) You can come during J-term! January at Smith is…cold. It is currently 90*F in Jamaica and sunny. It can also be hard to find opportunities during J-term. 4) Interns are required to keep a blog, which is excellent because it keeps a detailed record of what you do each day in picture and words, and can be used to illustrate your experience when applying for other internships and jobs. 5) The family eats strictly vegan (minus honey). Many of my friends who are vegan have difficulty finding good food while traveling, but here we eat superbly well. For more information you can check out my blog or visit Yerba Buena’s website. Haley is a rising Junior from Lamont House. She is an American studies major, English minor, and a sustainable food concentrator. I’m a student in the Environmental Concentration: Sustainable Food. In addition to the typical six courses required for a minor, concentrations at Smith require that each student engage in practical, hands on experience related to their topic. My first practicum experience for the Sustainable Food Concentration was absolutely amazing. I started out the summer at Hampshire College’s Food, Farm and Sustainability Institute. This program counted as both an academic and practical experience towards my concentration and I was also able to use Praxis funding towards the cost of tuition. The program ran from early June to mid July during which time I went to class for three hours each day and learned about pest management, soil health, livestock, and fermentation. We participated in animal and veggie chores as well as amazing field trips on Fridays. Fellow Smithies Theo Sweezy (’14) and Casey Rau (’16) were also in the program. I would recommend this program to anyone interested in agriculture in the Valley, especially others in the Sustainable Food Concentration. I decided to attempt to create a Sun Hive while I was writing my final paper for the Institute about biodynamic beekeeping. I had not thought about how integral honeybees are to agriculture, but after learning about Colony Collapse Disorder and watching the documentary Queen of the Sun I became passionate about the issue of disappearing bees and wanted to do something about it. After the Institute ended, I still needed to complete approximately 100 more work hours to fulfill my obligations for Praxis, and so the idea of creating a biodynamic hive was born. I absolutely love Smith courses but so often assessments are tests or papers, so this was a way to learn through a hands on project– and a lot of trial and error. I chose to create a Sun Hive because it is so different from Langstroth box hives and it aesthetically pleasing. The purpose of a Sun Hive is to create a safe haven for bees and not honey production, although during honey flow a honey super can be added to the top. The Sun Hive has removable arch frames so the comb can be inspected for mites and diseases. With my father, blacksmith Larry Crockett, who helped me tremendously with the woodworking aspects of this project. I purchased the design plans for the Sun Hive from a biodynamic beekeeper in California and he corresponded with me through emails and phone calls throughout the process. Completing the Sun Hive took about a month. The most time consuming aspect of it was collecting harding grass from my fields and processing it: cutting off the seed heads and side leaves, drying it, spraying it with water, beating it with a wooden mallet to make it pliable, and then sewing it with rattan cane. I entered the hive in the 251st Hardwick Fair where it won a state award from the Massachusetts Department of Agricultural Resources, which was a huge honor. At the Hardwick Fair with friends from Smith. 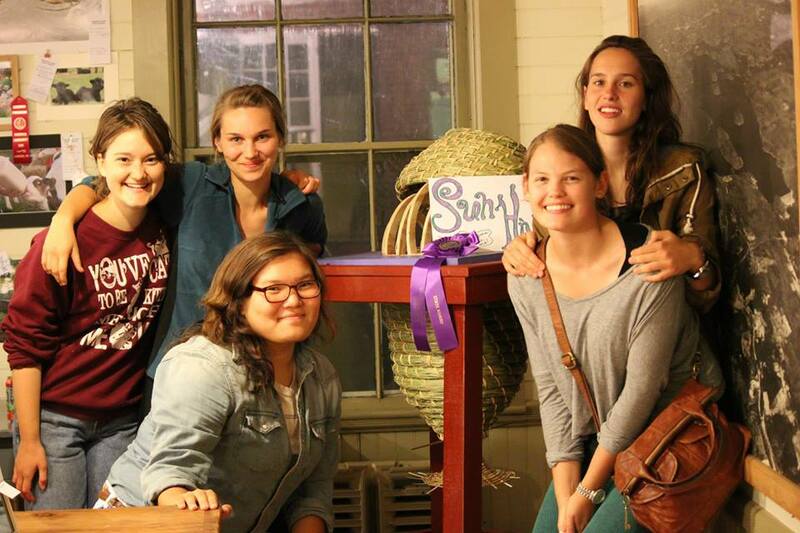 (L to R) Amelia Burke (’15) Haley Crockett (’15) Anuujin Elbegdorj (’15) Missy Kubik (’15) and Charlotte Dzialo (’16). Haley Crockett is a rising Junior from Lamont House. She is an American Studies major, English minor, and a Sustainable Food Concentrator.